Alex Warner, a photography student at the Glasgow School of Art, takes a conceptual look at the barrier of advancement and inequality women face in the world of professional football with his photo series “Grass Ceiling”. 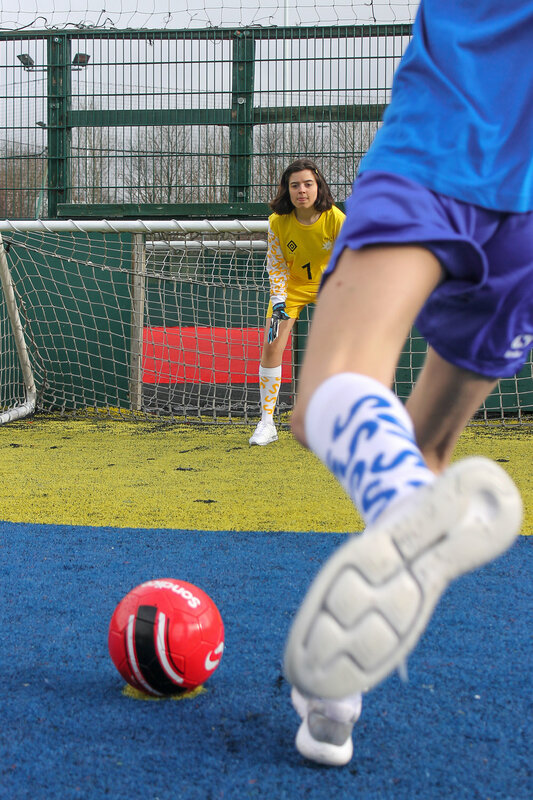 Commenting on a history of discrimination and lack of media and economic attention, Alex explores the identity of women’s football with a series that focuses on colour, homemade football kits and the female body successfully thriving in a typical male-defined space. The numbers are 1 (to represent a goalkeeper) 9 (to represent the strong, independent striker) and 21 (to represent a back of the changing room, the forgotten player). Put all the numbers together and you get '1921’ - the year that the FA decided to ban women's football. The team behind the kit itself is fictional - it’s meant to be a team GB kit, and the 4 stars above are a star to represent Wales, Scotland, England and Northern Ireland. It’s an abstract version of the Umbro logo with the words underneath saying 'UMNO’ - a common response women who want to play football hear from their male peers. The colours for the kits (red, yellow and blue) are an aesthetic of Warners work, as well as representing different team colours together that usually have toxic rivalry - Rangers Celtic, Arsenal Tottenham, Leeds Millwall, West Ham Millwall, Everyone and Millwall, MK dons (scum) (Alex’s words, not ours) AFC Wimbledon etc etc. The squiggles are an abstract representation of human cells which signify that everyone is made up of the same stuff - whether you’re a male or female, black or white. We’re all skin bone and a bunch of squishy squiggly stuff inside. Born and raised in South London, Alex has been an AFC Wimbledon fan ever since he can remember, holding a season ticket for well over 10 years. Currently, he’s still in his second year of University at Glasgow and working on making the grass ceiling series into a zine to be sold at the Glasgow zine fair in April. Follow Alex here.